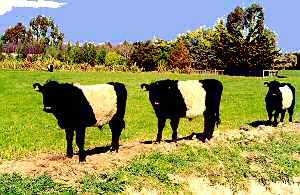 The first Belted Galloway cattle, affectionately known to their followers as ‘Belties’, arrived in New Zealand in 1947. It is a native of Scotland, but it is not the world’s only belted (or ‘sheeted’) breed. Such cattle, characterized by a wide belt of white hair encircling the body, are – or were – found in a number of other countries throughout the world, although mostly in Europe. Just where the characteristic and distinctive ‘belt’ sported by these various breeds originated is not known. It is, of course, possible that it evolved quite independently in different countries. However given the known prepotency of the belted gene when any cross-breeding occurs (it is extremely dominant and persists for generations after introduction) it is equally likely that it arose from a single genetic mutation and was passed on with the animals that carried it via the usual channels of trade and commerce. The original Galloway, of the unbelted or standard breed, was found in an early period almost exclusively in the south and west of Scotland, an area of lowlands known as the province of Galloway. Exactly how and when ‘Belties’ evolved is not known with certainty, but they have been recorded, usually as isolated animals among the standard herds (from which the belted variety clearly derives) since the early eighteen hundreds. Historically, it is certain that there was a great deal of trade between Scotland and the so-called ‘Low Countries’ of the Netherlands in the sixteen and seventeen hundreds. Given the genetic dominance of the belting pattern in the Dutch » Lakenvelder, it seems almost certain that the Belted Galloway resulted from the crossing of the two breeds, probably following the importation of some Dutch animals into Scotland. There is no recorded evidence to support this theory but added weight is given by the better dairy qualities of the Belted, as opposed to the original Galloway, which might well result from an infusion of Dutch cattle’s blood. Traditionally the belted variety of Galloway was selected by village women in Scotland especially to keep for milking. The first herd book for the Belted Galloway was started in Britain in 1921 when it achieved status as a separate breed. Like the original Galloway (which also arrived in New Zealand in 1947 – see » Standard Galloway) the Belted breed is a medium-sized, basically beef animal, with a shaggy, double, weather-resistant coat – one of its distinctive characteristics. It is extremely hardy, is an excellent forager, and thrives best in cold rough or hilly country. It is an efficient converter of rough pasture into relatively lean meat, while the cows breed easily, are long-lived, and are excellent milkers and mothers. It was imported into New Zealand originally because of these qualities, but has never become established as a major breed, and is today classified as rare. However, those who are looking for easily managed cattle with excellent utility qualities and a striking appearance (they can be black or dun coloured, but always with a pronounced white belt), could do no better than consider the Belted Galloway.